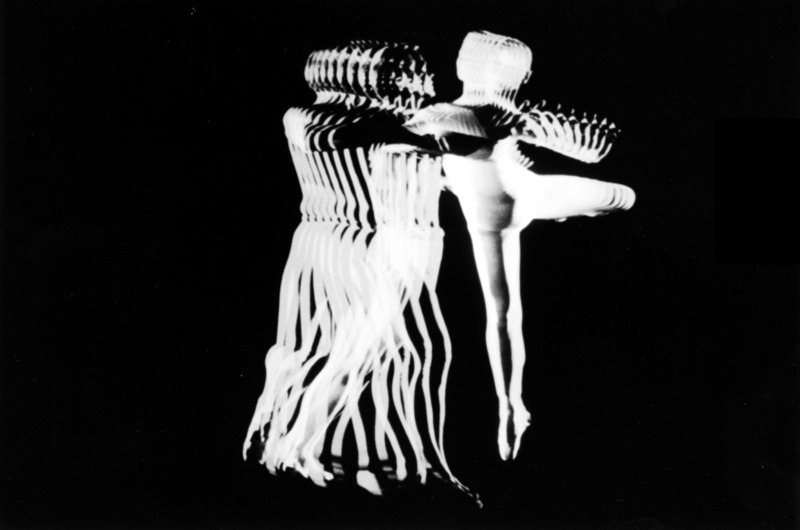 ‘McLaren 2014 is a Programme celebrating the centenary of pioneering Scottish artist, filmmaker and musician, Norman McLaren.’ (http://www.mclaren2014.com/about_the_project). 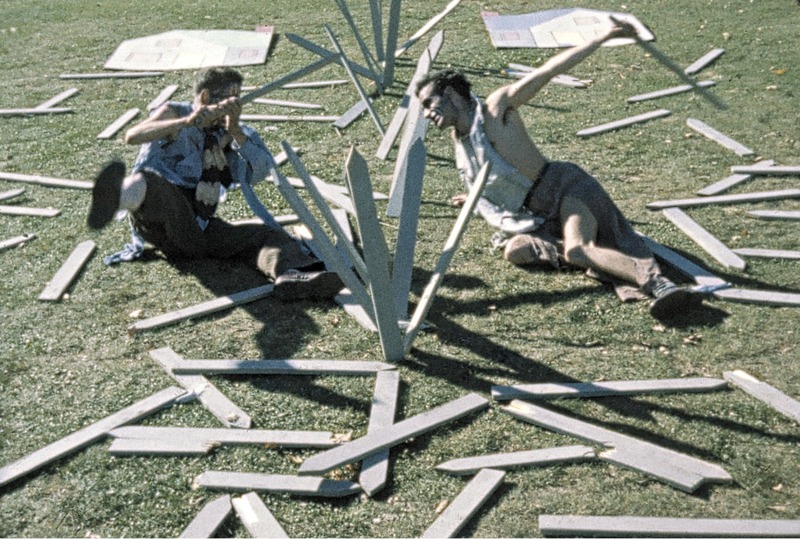 Subject to small changes, the programme of shorts will last 1h20 and include: OPENING SPEECH (1961), BLINKITY BLANK (1955), LE MERLE (1958), PAS DE DEUX (1968), SYNCHROMY (1971), LINES HORIZONTAL (1962), NEIGHBOURS (1952), Là-HAUT SUR CES MONTAGNES (1945), V is for VICTORY (1941), LOVE ON THE WING (1938), HEN HOP (1942), BEGONE DULL CARE (1949) and A CHAIRY TALE (1957). I was familiar with the brilliant Pas de deux (above) and Neighbours (below) and if the rest didn’t come up the standard of those two classics that’s not a criticism. McLaren’s GPO film, Love on the Wing baffled me but it was clear that he was pioneer of absurdist comedy, using animation, with his Opening Speech and A Chairy Tale. McLaren made Neighbours in 1952 after visiting China; although the version that won an Academy Award was shorn of its ending when mothers and children become victims of the fighting neighbours. Seeing that, at a time when many civilians, children included, have been killed by the Israelis, was chilling. Post-modern frippery can only take you so far… and that’s not ‘very’. Rango‘s mix of the spaghetti western and Chinatown (US, 1974) is brilliantly done ranging from Johnny Depp’s charming eponymous hero, a lizard, to Ned Beatty’s perfect impersonation of John Huston’s villain, a tortoise here, in the classic noir, directed by Roman Polanksi. Add a sequence that manages to mix Stagecoach (US, 1939) with Star Wars (US, 1977) then you have an extremely inventive film. The Star Wars-Stagecoach mix is not so far-fetched as the latter is a ‘western in space’, but it’s nevertheless dazzling as you realise it’s unfolding before your eyes. The plot revolves around ‘controlling’ water, the same as Chinatown. The ‘spaghetti’ bit of the ‘western’ is emphasised by the mariachi chorus and the ‘down and dirty’ characters of the town… Dirty. The Man With No Name also makes an appearance, Timothy Olyphant managing to sound exactly like Clint. Most of all Rango is laugh-out-loud. 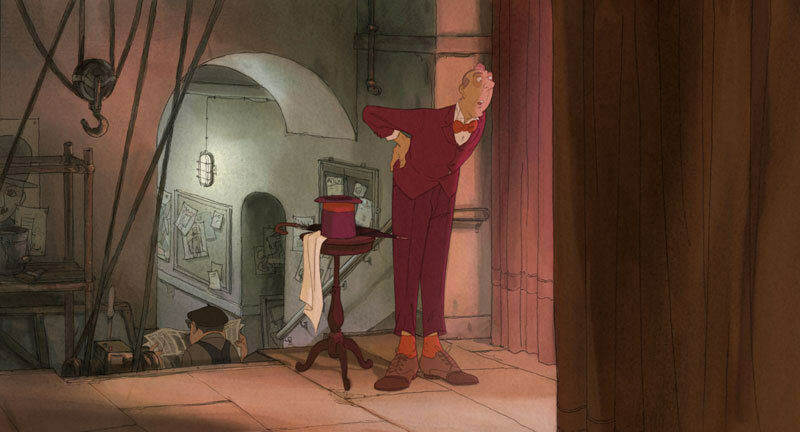 Sylvain Chomet’s beautifully animated Jacques Tati tale has ‘retro’ impregnated as firmly as the word ‘Blackpool’ in its eponymous rock. It’s beguiling, elegaic and deeply conservative so my guess is its appeal, which is almost universal amongst UK critics, will be limited to the middle aged. Like Tati’s films, Chomet’s adapted an unfilmed Tati script, there’s barely any dialogue, non verbal communication tells us all we need to know and the comedy is mild; very gentle slapstick. I don’t mean to sound negative, if that’s how you’ve read the above, as I urge you to bathe in the film’s nostalgia; though you may be too young for that. Set in Edinburgh, mostly, in 1959, a city that seems to be populated by French-looking people (! ), the story recounts the end of the music hall era as the ‘illusionist’ comes to understand ‘disillusion’. The film reminded me of Paul Berry’s brilliant short The Sandman (UK, 1991), particularly in the focus on eyes, and Coraline‘s Grimm inheritance makes sure that this fairy tale is properly scary. The stop motion animation is fantastic, it has the flexibility of CGI, particularly with the elaborate camera movements, without the technique’s ugly ‘plasticness’. This was always going to be far more interesting than Monsters vs Aliens but it is interesting to compare its use of 3D. For Monsters I felt it was a distraction, in Coraline the use was more integrated into the animation probably because the visuals were so fabulous anyway that the ‘breaking of the screen’ (ie the moment when the images appear to come out of the screen) simply added to what was being shown. Whereas in Monsters the ‘3D moments’ felt contrived and so drew attention to themselves. 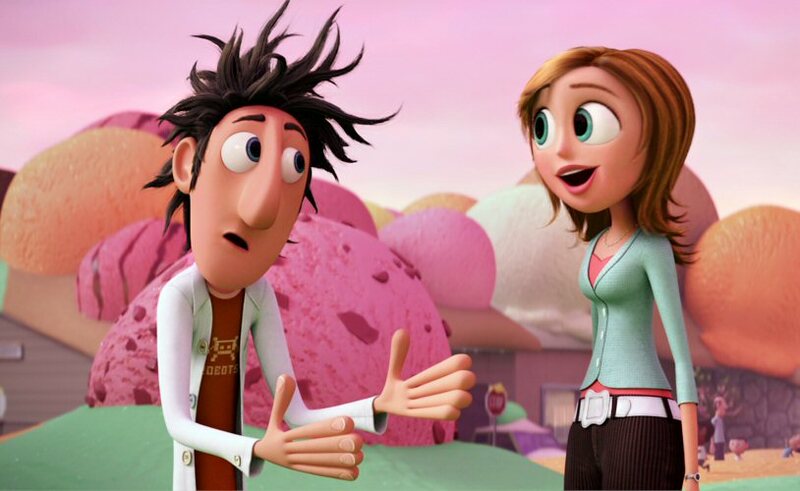 Of course Hollywood has sold whatever bits of its soul it still has to CGI, there were trailers for Ice Age 3 and Up in the screening I saw, and while it’s ridiculous, aesthetically, that Monsters should gross over $100m more than Coraline in N.America, the latter’s $75m isn’t bad. This postmodern (all the monsters are from ’50s SF movies) concoction has some interesting visuals and shedloads of limp gags (one or two are OK) and a terrible ‘girl finds career-minded fiance is not worth it’ sub plot. I saw the film at the National Media Museum’s IMAX (Bradford, UK) in 3D; the first 3D film I saw was The Creature from the Black Lagoon (1954) – not when it came out! – and the 3D technology has certainly moved on from then. However the reasons behind Hollywood increasingly using 3D are the same: competition from other media. Although the North American box office take has remained stable in recent years the number of tickets sold are in decline and the days when DVD was a cash cow appear to be over unless consumers decide they must have Blu-Ray. So far, it seems, that cinema-goers are happy to pay a premuim for the dubious delights of 3D; James Cameron’s Avatar, slated for release at the end of the year, will be an interesting test-case as to 3D’s immediate future. My experience of 3D, in both films, has been that you soon get used to it so after a few moments of ‘wow!’ the eye adjusts to the new perspective and so it becomes very similar to perspective in standard films. It could be that the urge to duck, as a tennis ball approaches your headi(n the Independence Day (1996) pastiche that starts Monsters) mimics the Early Cinema audience allegedly legging it out of the way from the Lumieres’ Arrival of a Train at La Ciotat (1896) but the effect is short lived. As a ‘Cinema of Attraction’ 3D must do more than make us flinch for a few moments. Unfortunately Monsters vs Aliens offers very little other than an attractive looking film. The subversiveness of the Attack of the 50ft Woman (1958) is wholly absent; the satire of the (non) macho President is wholly hackneyed…. … and the Godzilla (Gojira, Japan, 1954) stand-in is wholly anodyne; in fact I can’t think of a less characterised character. UPDATE: I got this one wrong, Kim Newman says (in the June issue of Sight and Sound) it’s Mothra from the 1961 film of that name. The other two monsters are from The Fly and The Blob (both 1958). I don’t know where the alien comes from (comments please!) but it is very similar to those in Mars Attacks! (1996) which were based on bubble gum cards. The alien is a terrific-looking creation, well characterised with marvellous sound effects. From a cineaste’s point of view, 3D is just not very interesting. Far more engaging is the use of deep focus where the relationship between fore and background are dramatically intertwined and so give us an emotional jolt and not the saccherine satisfaction of 3D in this film. There’s been some discussion about how Persepolis and Waltz the Bashir have brought animation to ‘maturity’ with their serious take on the world. No doubt this remark has been made many times and is a symptom of people suddenly having their preconceptions about animation challenged. Why animate a film/drama documentary about the massacres in Sabra and Chatila in Lebanon, 1982 (Robert Fisk is by far the best British foreign correspondent – here’s a recent report)? Writer-producer-lead actor-director Ari Folman structures the film around his attempt to remember what role, if any, he played in the massacres when he was serving, as a 19 year old, in the Israeli army. The film covers his quest and, given the unrealiability of memory, and the importance of dreams in revealing and suprressing memories, animation is the perfect medium to render the surreal mix uncovered by Folman. I had a sense that Folman was speaking to an Israeli audience who are in denial about the atrocities and so gently guides us/them to the truth. By focusing on individuals, mostly teenage boys entirely out of their depth, we see the Israeli participants as victims also; though obviously not in the same way the Palestinians were. Is this an apologia? I don’t think so; I think Folman is looking for the truth and the final image we have of him is of as a man-boy in shock as the survivors leave the camp. The shock is obviously caused by what he’s seeing but is also the contemporary Folman who has, at last, remembered his complicity in the massacre. It is a brave person who publicly admits such culpability. The Palestinians have no voice, except the wailing women at the end, but this is about the Israeli experience. Of course it would be near-impossible for Palestinians to have their say – but their story needs to be told. Visually, the film is stunning; cities turned into Ballardian landscapes; the dream sequences mixing horror and beauty; a terrific use of music (PIL’s ‘This Is Not a Love Song’ accompanying Folman on furlough). The image above is a scene where Folman goes to war in a ‘love boat’; or rather, partying on an old boat. There are no women but he dreams of this giant woman rescuing him from war. Women rarely feature in the film; but there are two mothers and one jilting girlfriend. At the end, the rotoscoped animation morphs into reality with BBC and ITV news footage of the aftermath of the massacre. Inevitably it is a devastating moment but wholly in keeping with the film’s intent: to render the memories into a reality. It’s the best film I’ve seen this year.